Sauerkraut is a Gluten Free Food. Does It Have Probiotics? Raw Sauerkraut: What's the Big Deal? Raw sauerkraut is a powerhouse of nutrition made from fermented cabbage. When properly made, it's a naturally gluten free, low calorie food that is full of live cultures such as Lactobacillus bacteria, and may even be considered to have probiotics in some cases. That is why I recommend that you make your own (watch my easy video) if at all possible, or at least buy raw varieties from respected sources. Sauerkraut is basically cabbage fermented in salt water. The right amount of salt in the water is important to allow the live cultures of lactic acid bacteria and friendly yeasts to thrive, yet keep the harmful bacteria from multiplying. This keeps the cabbage crunchy and unspoiled. Temperature is also an important consideration. Cabbage ferments best at about 65-75 degrees F. Over 75 degrees, it may ferment too quickly and become soft. If you eat it the ferment too soon, the beneficial bacteria and yeasts haven’t had a chance to take over. If you eat it too late, it could be too acidic and many of the otherwise “good” bacteria would have stopped growing or died. Finding the Goldilocks time-frame for your environment with each unique head of cabbage is the key to great-tasting kraut. That is why I like to taste the ferment after it stops strong bubbling, which for my environment during the winter, is about 8 days. Where Do The Live Cultures Come From? Believe it or not, the raw vegetables you use, such as the cabbage, already have the microorganisms on them to ferment them, even after you’ve rinsed them off. This is one of many reasons why I use organic produce when making sauerkraut: it only has to be rinsed off since nasty pesticides, fertilizers and herbicides are not permitted on organic produce. It is important to have a mix of microbes to keep the kraut balanced. Mother Nature already figured that out for us! Note: Save any extra salty liquid! It can be used as starter water for your next batch, or you can keep it refrigerated, dilute it and drink it (a little at a time!). sprinkle it on salads, or mix it into salad dressing or other cool food items right before consuming them. This salty liquid is teaming with live cultures! What are the Health Benefits of Sauerkraut? Since sauerkraut is a food, it is not meant to treat or cure any disease. As a result, no specific health claims are made for it. However, since it does contain several strains of lactic acid bacteria, I believe that it belongs in a healthy lifestyle. Also, it contains species of microbes that are classified as “probiotics”, so regular consumption (to meet the “adequate numbers” criteria of the definition of probioitics and the “live organisms” criteria) can help to keep the flora in your body more balanced and keep harmful microbes more under control. 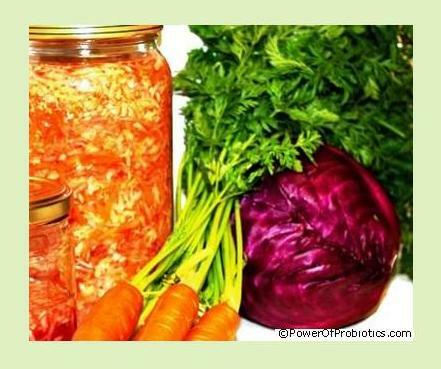 Fermented cabbage has less sugars and more beneficial microbes than the raw cabbage, while still maintaining most of the vitamin C and other nutrients in the raw cabbage. While the live cultures use up some of the cabbage's nutrients, the benefits they provide outweigh the losses. My suggestion is to give homemade sauerkraut a try by watching my easy video, even if you start with a quart jar to ferment it in. You can save a lot of money by making it at home as my article shows. If you really don’t want to make it at home, I urge you to buy only raw products from trusted sources. You can find several varieties already cultured, but either only partially raw or totally pasteurized, in jars at most natural health food stores and grocery stores, but these won’t have the same benefits as the totally raw sauerkraut. To move to the page about other sources of probiotics, click here.